San Giorgio, the Best view of Venice Italy ! The bell tower of the island of San Giorgio is only two minutes away from the San Marco Square with the Vaporetto Boat no. 2. The vaporretto boat can also be taken from Piazzale Roma and elsewhere from a stop on the Grand Canal. Vaporetto line no. 2 always stops at the S. Giorgio. The best-kept secret is that tourists only see the island from a distance from the San Marco area. But, you can reach this island in a few minutes and visit the church of S. Giorgio. When you enter the church - called S. Giorgio Maggiore - you will first admire two famous paintings (Tintoretto's last supper). On the left, you can continue to walk until the end where you will enter a hallway. Over here you can buy tickets to come to the top of the church tower. A ticket will cost around EUR 6,00 per person. You can only use an elevator to go up because there is no staircase for the public. The church and the tower are open until 17:00 pm during the months April until October. With its beautiful sight and the skyline of Venice Italy, you can enjoy the lagoon view. The best is that you will maximize your time here and enjoy taking pictures. On the island of Giorgio, the main attractions are the church and the tower. TIP: You can use your same vaporetto ticket for a return to San Marco Square if it didn’t reach its limit of 75 minutes. Discover the island of San Giorgio more! Isola Di S. Giorgio, as the Venetians, mentions it. It was first an island for monks and a center to learn. The learning center is still in use. The owner of the center is the Fondazione Giorgio Cini organization with a research center and laborers school. Please take a look at www.cini.it. You can enter the buildings on the island at the weekend with a tour. And have a look at some objects from the composer Vivaldi and a unique maze garden… It costs about EUR 8,00 for a visit. Be smart and get a cheap parking place when you are visiting Venice Italy! Here is an overview and mostly they have shuttle services to Venice... Check it out! 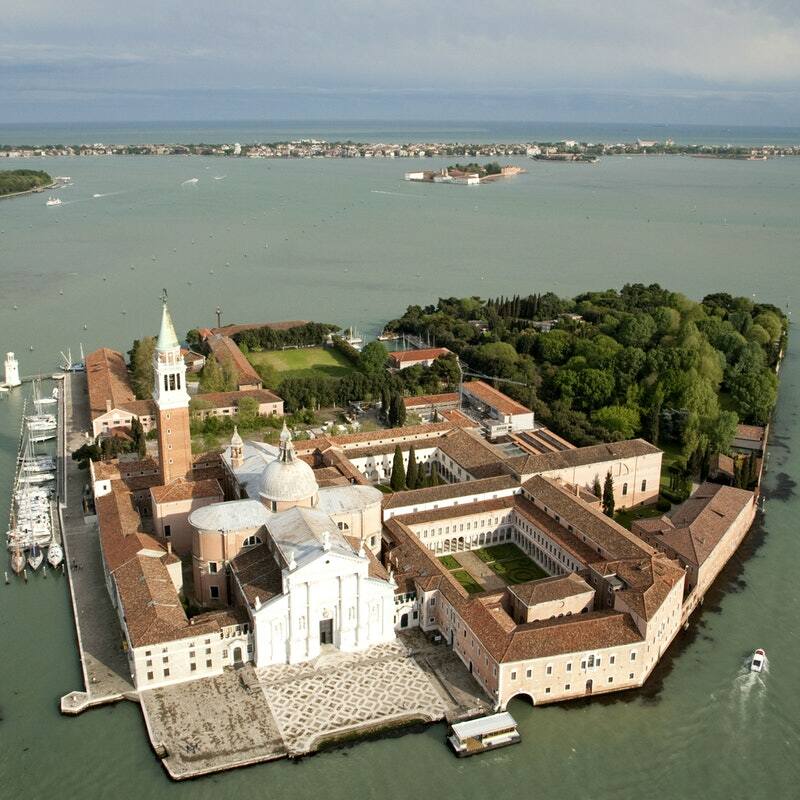 You have read about the island of S. Giorgio in Venice. There is plenty to discover, as you read. Discover my site about Venice Italy and get more information about this beautiful Italian city. Finest News about Venice Italy? I consent to you using my information only to send me sometimes your VENICE INFORMATION newsletter. I understand that I can unsubscribe at any time by clicking the unsubscribe link at the bottom of any email. Why the Gondolas in Venice are World Heritage? All materials on this website are copyrighted. No part of this site may be used without prior permission for publication in other media. It is prohibited without written consent, and it is not permitted to copy information from this website or disseminate in any form whatsoever.